Hi there! 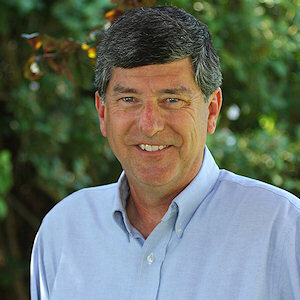 I'm Jim Zim... and this is my home on the web. My full name is James Allen Zimmerlin, but I like my friends to call me Jim Zim. My initials have a ring to them, too... they're JAZ. 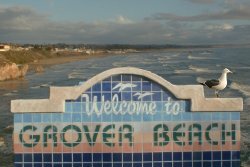 I live in Grover Beach, California, a neat little town located about halfway between Los Angeles and San Francisco. My house is just a 14-block bike ride away from the Pacific Ocean! I live with my wife, Kellyn, and with Morgan, the one dog we decided to keep after 15 years of breeding American Cocker Spaniels. I'm mostly a homebody. I spend most of my free time at home... working in our yard, enjoying movies or television shows on our big 80" HD TV, or fiddling around with my computer. You don't find me out at bars, or attending sporting events, or hiking and camping. You will frequently find me in restaurants, though! Kellyn makes me a great breakfast every morning, but we eat far more of our other meals in restaurants than we do at home. I've been through a lot of phases in my lifetime. There was the phase where I was "the baby" in a family of four kids... the phase where I discovered that I liked girls... the phase where I discovered that I really didn't like college classes... the phase where I learned about all the freedom that comes with being a single young man on his own in his early 20's... the "honeymoon phase" of the first few years of married life with no kids... and a long stretch of about twenty years where we raised our two kids. 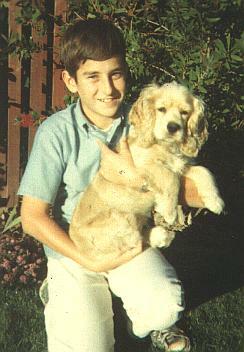 There was also the phase where I was a disk jockey... the phase where I was a salesman... the phase where I started earning big bucks working in a "real job" at a nuclear power plant... and 15 years where my hobby was breeding American Cocker Spaniels. 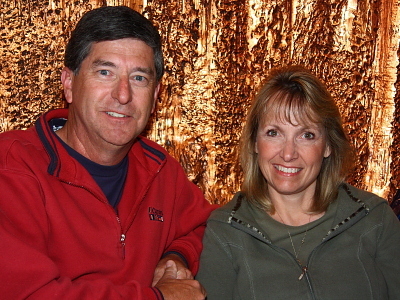 Now, at the age of 61, I'm in a very comfortable phase where I've been married for 37 years... where I don't have to worry about money... and where I spend a good deal of my energy planning the next vacation! In fact, to truly understand me... you have to know that these days, my life is all about "the next vacation"! For quite a few years, my favorite vacation was visiting my sister's farm in Washington state. It's a lifestyle very different than living in a city like I do. Getting there is half the fun... it's a 1000 mile drive each way from here... but we did that drive many times with our kids. These days, with the kids all grown up and on their own, I'm more likely to just take a quick airplane flight up there instead. But I don't visit the farm anywhere near as often as I used to, because these days I tend to spend almost all of my vacation time on cruise ships. Kellyn and I have been on 45 cruises so far! Cruising is such a big part of our life these days that I could write an entire web page just about it. In fact, I have! Take a look at this page, with some great pictures and videos from my favorite cruises. The last few years have been so good! 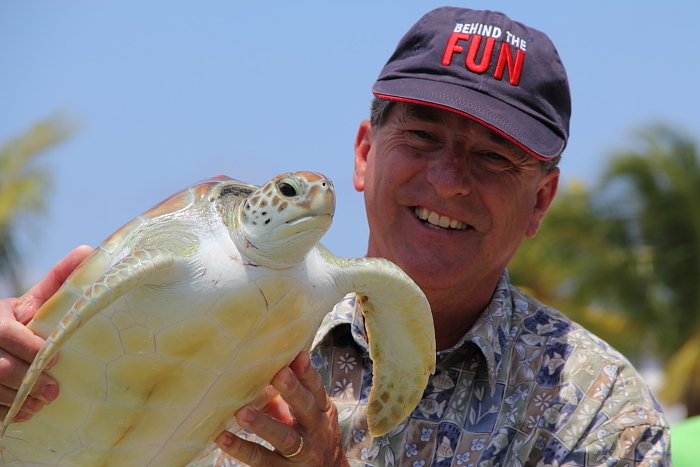 Kellyn and I have been enjoying some GREAT Caribbean cruises. You just can't beat swimming in 80 degree water at a beach in the Caribbean! Up until 2013, most of our cruises had been with Carnival cruise lines... but in 2014 we started branching out a bit... and now we've had some great cruises on Princess, Norwegian, Royal Caribbean, and Viking Ocean cruise lines, too. I've achieved platinum status in the loyalty programs of Carnival, Norwegian, and Royal Caribbean... but I actually think of Norwegian as my main cruise line of choice these days. A stay in "The Haven" on any of Norwegian's ships is the perfect vacation, as far as I'm concerned. The Haven is a luxury experience available to a small number of guests who stay within a private V.I.P. section of the ship. It's an expensive way to cruise, but totally worth it... because you get all the benefits of sailing on a big, state-of-the-art cruise ship, but without the crowding... and with a whole lot of pampering! in the adults-only swimming pool onboard Royal Caribbean's "Independence Of The Seas"
So, when I got home from that cruise on the Carnival Spirit... I edited together my little Green Thunder waterslide video, uploaded it to YouTube, and didn't give it another thought. To me, it was just another in a series of many cruise ship related videos I've posted to YouTube over the years. I literally forgot all about the video and went on with my life for the next couple of months. Completely unknown to me at that time... the video went viral on YouTube! And I didn't even realize it. The day that I discovered my video had gone viral was the day I started becoming a much more serious YouTuber! The first thing I did was to learn how to monetize my videos. Monetization on YouTube is the process of allowing YouTube to run ads along with your videos. By allowing YouTube to run ads with your video... you earn a portion of the advertising revenue generated by the ads. That's what monetization is. I didn't really have a clue what kind of advertising revenue I might be able to earn by monetizing my YouTube videos... and I knew that I had really blown it by not monetizing the Green Thunder Waterslide video BEFORE the first two million views... but all I could do was to monetize it at that point and hope that two million views was just the beginning. And that's exactly what it was. As it turns out, the first two million views were indeed just the tip of the iceberg. It boggles my mind to be able to say that my little video has now been viewed over 94 MILLION times! Is that crazy, or what? Just to put that in to perspective... if you go to YouTube and do a search for "Carnival Cruise" and then sort them by the number of views, you'll find that my video is -- by a wide margin -- the most viewed YouTube video about a Carnival cruise that there is. In fact, don't just limit it to Carnival. Do a search for "cruise ship" and sort by number of views and you'll find that my little Green Thunder video is the #1 YouTube cruise ship video of them all! First off, you're probably wondering... have I made a ton of money off of it? The terms of my the monetization contract with YouTube forbid me from discussing the specifics of that aspect. Let's just say that thanks to all the YouTube advertising revenue, I've been able to go on a LOT of great cruises. Per the contract, I can't say exactly how much money I've made from YouTube... but I can honestly say that it's been a LOT of money, and it has totally changed my life. And yes, the I.R.S. gets their share, for sure. It was a little slow to catch on, but by August of 2015 it finally passed the one-million-view mark and now it's past 11 million. 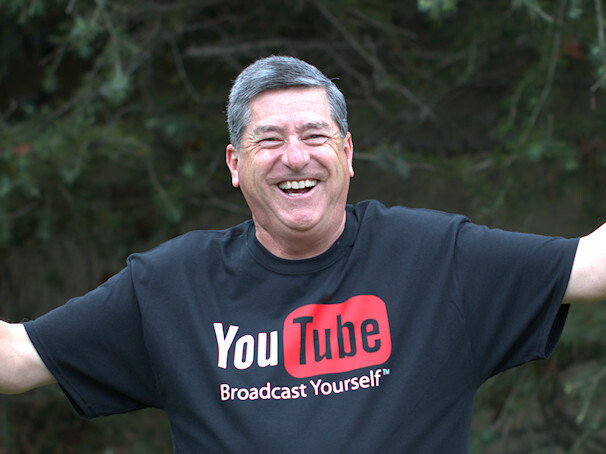 It was my second viral video, and it created a nice increase to my advertising revenue! As an experiment, I recently created some videos in 360 degree virtual reality. I bought a Samsung Gear 360 VR camera, after I noticed they severely dropped in price. (Perhaps a new model is coming out?!?) Check out this video where I attached the 360 degree camera to one of my steam trains, and created a video that allows the audience to control their viewpoint and look all around in any direction. This one is best viewed on a smart phone running the YouTube app, but will also work on a desktop or laptop computer. On a smart phone or tablet, physically swivel the device up/down/left/right and the view of the video will change with the movement of your device. 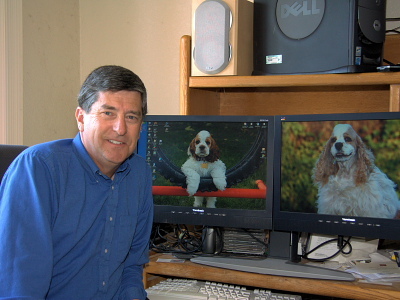 On a desktop or laptop computer, "grab" the video with your mouse to move the point of view. By 2018, I felt like I had really hit my stride with YouTube and had a good feel for what was working with the YouTube audience. It was getting easier for me to create videos that got a lot of views. As of this writing, I've now had 17 videos pass the one million view mark on YouTube! And my new personal best was a video that got a million views in just eight days! If you think my model trains are interesting, take a look at this page where I talk about them in a little more detail. Another way to measure success of a YouTube channel is by the number of subscribers. Over 280,000 people have subscribed to mine. I think that's pretty cool! Anyone that reaches 100,000 subscribers gets a neat little recognition gift from YouTube... a special plaque known among YouTubers as the "silver play button"! I keep shooting videos and trying new things. As of this writing, I've got over 450 videos on my YouTube channel and collectively they've been viewed over 240 million times! 17 of my videos have over a million views each! I was born in Chicago, Illinois, but my family moved to the town of Orinda in the San Francisco Bay Area when I was two years old... and I've lived in California ever since. 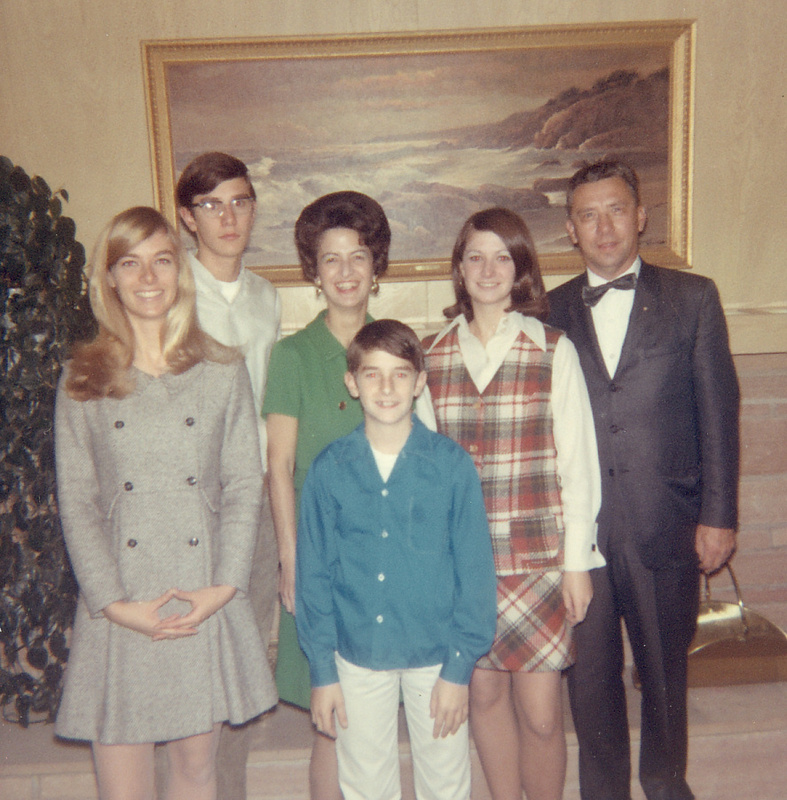 I grew up in a very "normal" family with three siblings, two Cocker Spaniels, and parents that were straight out of an episode of Ozzie & Harriet. I really appreciate the way my folks raised me... it was full of love and low on confrontation. You hear a lot about disfunctional families... well, I was one of the lucky ones whose family was functional. In 1975 I moved to San Luis Obispo to attend college. I started as a computer science major, but discovered pretty quickly that volunteering at the campus radio station (read my anecdotes here) was a lot more interesting. This was the beginning of my career as a disc jockey... one of three careers I've had. 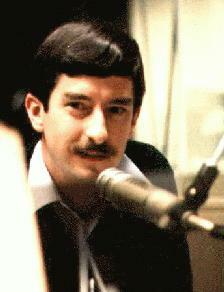 At the peak of my radio career I was the Program Director of a soft rock radio station. If you'd like to hear what I sounded like in those days, listen to this "aircheck"... which is a five-minute clip of me on the air, with the commercials and music edited out. My radio career came to a crashing stop when the station was sold and the new owners fired me! But getting out of radio turned out to actually be a good thing for me, because once I got in to sales I started making a lot more money. There's an old joke about being a disk jockey that pretty well sums it up: what's the difference between a disk jockey and a large pepperoni pizza? A large pepperoni pizza can feed a family of four! My first sales job was selling consumer electronics equipment for a big chain of audio/video superstores. Later, I graduated to selling computers, and eventually to Honda automobiles. But being a salesman is very stressful. There's the aspect of working strictly on commission rather than having a guaranteed paycheck like you would in a "real job"... and then there's the aspect of dealing with customers all day long. Stressful! Not to mention dealing with sales managers! So, after many years in sales, I jumped at the chance when I finally got offered a "real job" with Pacific Gas & Electric company in 1992. No more career changes for me now... this time I'm in it all the way until I retire! The pay and benefits are excellent... but the best part is that they give me a whole lot of paid vacation time. That's great, since I like to take all those cruises! 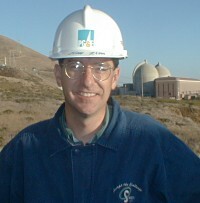 During most of my PG&E career I've worked at the Diablo Canyon nuclear power plant, although I did also spend a couple of years as a meter reader... an experience I'm hoping to never have to repeat! My PG&E career story is one of those classic stories that begins with working in the mailroom. If you want to read the rest of the story, you have to take a look at my Diablo Canyon page. It is kind of an interesting story, and it's illustrated with a lot of great pictures I've taken over the years, so do be sure to visit that page. 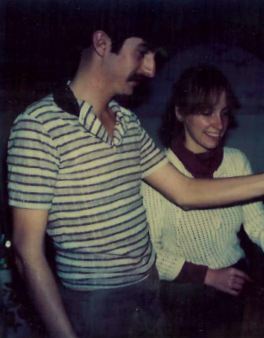 Kellyn and I met in San Luis Obispo in 1980 and we got married in 1981. 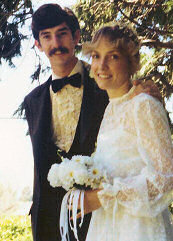 OK, yeah, I realize now that the mustache in the wedding photo was horrible. It took me about ten years to grow out of the mustache phase, but I've been clean-shaved for over twenty years now! And speaking of the wedding photo... Kellyn made that dress. We laugh now when we think about our ultra low-budget wedding! I think the total amount we spent for everything included in our wedding was about $500. It had only been a couple of weeks since I first met her. I was working as a disk jockey and I got invited to a party thrown by one of the major record companies. To appreciate this story, you have to understand that I was a clean-cut kid who grew up in a idyllic environment. Boy Scout... student body president in the 6th grade... that kind of thing. While it's true that I grew up in the 60's and 70's... I was as far from the "let's smoke pot and protest the Vietnam war" thing as a guy could be. In fact, I had absolutely zero experience with marijuana... until the infamous record company party for all the local disk jockeys! So, when Kellyn and I went to that record company party... and they offered me a brownie... it simply never occurred to me that the brownie had anything funny in it! Really, I was just a naive kid who had no clue about that kind of thing! I had really never been a very big fan of brownies up until that point... but WOW, that was a great tasting brownie! Better than the ones mom used to make, that's for sure. So, I had a second one. And I think I might have even had a third... I don't exactly remember, because at that point I started to feel kind of odd. I didn't exactly know what was happening to me, because I had never been STONED before! All I knew is that I was feeling kind of sick, and I needed to get out of there. And I was in no condition to drive us home, so Kellyn was going to have to drive. Which was fine, except for one little problem! We had driven there in my Volkswagen Beetle, and Kellyn didn't know how to drive a stick shift car. Well, she was about to learn! So, there we were driving home... Kellyn getting her first lesson on driving a stick shift from her new boyfriend who was now stoned out of his mind (for the first time in his life). You can pretty much imagine how that went. Through some miracle, my VW's transmission survived. I do remember an awful lot of gear-grinding noises! But we did somehow make it back to my apartment. Kellyn was very sweet and nurturing and got me safely tucked in to bed so I could sleep off the effects of the brownies. I felt like I had an angel taking care of me. I was SO appreciative of the gentle way she treated me! So appreciative of this little angel, that I just HAD to tell her. So, as she stood beside the bed making sure I was alright... I looked up, right in to her eyes... and said to Kellyn: "I love you, Terry!" Here's a story that will probably surprise you about us. It might even surprise you that I would share this story. No, I guess after that last story... you wouldn't be surprised by anything I'd write! 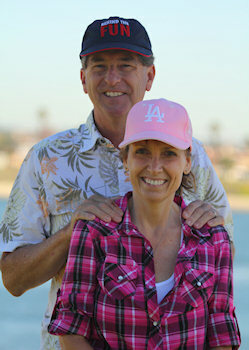 As you know, Kellyn and I have been married for over 30 years now. But for a while there, it didn't look like we were going to make it to the big 30th anniversary. Every marriage has its rough spots, and ours hit rock bottom in 2010. We actually filed for divorce in June of 2010. In California, there's a six month waiting period before a divorce becomes final... and we are a perfect example of why they build that six month wait in to the process! In October of 2010, after a 4-month separation, we came to realize that our 30-year relationship could and should be saved and cherished. The divorce process really shook things up for us, and ended up having the amazing effect of strengthening our marriage. It was a painful way to realize what we had and what we wanted, but the end result was a good one. The renewal-of-vows ceremony on a cruise ship is not free. So, there's a payment involved. When we received the receipt for our payment, we realized that English was probably not the native language of the person that wrote it... because the receipt stated that it was for our "renewal of vowels"! The years go by pretty fast... it doesn't seem like that long ago since I was a girl-crazy high school kid... but now I'm a grandfather and I qualify for the senior discount on Carnival Cruises. Where does the time go?!? Speaking of my high school days... something really big happened to me back then. No, I'm not referring to that night in the early 1970's when I experienced both my first visit to a pizza parlor and my first kiss... all on the same night! I'm talking about my introduction to computers. It was somewhere around 1972 and some big company donated an outdated computer to my high school. The computer took up the better part of a small room, and basically didn't do anything other than very elementary word processing tasks. This was in the days way before hard drives and floppy disks... when data was stored on paper cards or paper tape with holes punched in them. What a thrill it was to be able to save a business letter on to paper tape and to reprint that letter again later! I vividly remember that computer at the high school... with the jumper wires to configure, and the dozens of replacement circuit boards to use when something blew up! Lots of fun for a teenager in a world where the personal computer hadn't even been invented yet! Ever since then, I've been a very computer-oriented guy. These days, my life is made so much richer thanks to computers and the Internet. I've met so many interesting people, and had so many great experiences as a result of our connected world. Things have sure come a long way since that first computer I used in high school in 1972 with the data stored on paper tape with punched holes! Speaking of computers... I really have to salute our local cable company, Charter Communications, and the very fast Internet connection we get with our cable modem. I get sustained download speeds of 60 mbps and upload speeds of 4 mbps... which sure makes it easier to do things on the Internet than it was back in the 1990's when we used to have to dial in with a modem! Test your connection and see how your Internet speed compares to the 60 mbps up / 4 mbps down speed that I get. I also appreciate great technology when it comes to photography. I've actually owned eleven different digital cameras over the years... and these days I'm using a Canon EOS 80D digital SLR camera as well as a waterproof Olympus. Check out my photo gallery, where you'll see some of the best pictures I've taken with the various digital cameras I've had over the years. A few years ago, I took all the best Cocker Spaniel photos I had ever taken and put them together in to what I call "my coffee table book". The Canon EOS 80D that I use is really too much camera for most people. If you're interested in spending the money to get a high quality digital SLR camera and you're wondering where the "sweet spot" is in the compromise between quality, features, and price... I'm here to tell you it's in the Canon EOS Rebel T6i with the 18-135mm STM lens. For me, price wasn't the big concern... so I stepped up to the 80D. But for most people, the T6i is the way to go. Just make sure, if you buy a T6i, that you get the 135mm lens and not the cheap 55mm lens. I am totally sold on Canon technology. Besides the awesome digital SLR camera, I also use a Canon flatbed scanner for scanning prints, slides, and negatives... and I have a Canon Pro-100 printer that has made some incredible 13x19" prints which I have on display in my house. I'm also lucky enough to have a lot of wall space in my office at work... so I've posted all sorts of cool pictures there, too... all printed on my Canon printer at home. 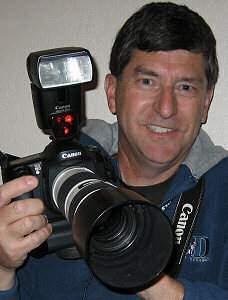 One of the things I most appreciate about Canon digital SLR cameras is the high definition video they can capture. They can shoot video in full 1080p resolution... with quality as good as what I'm used to seeing from my blu-ray disc player. I've had excellent results shooting video with the various Canon cameras I've had over the years. 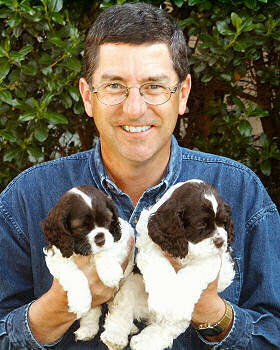 For example, I used one of them to create my Cocker Spaniel grooming videos. Take a look at my YouTube page for more of my videos! 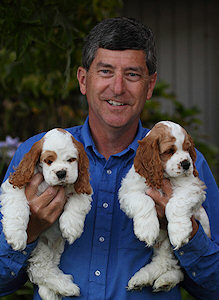 A big part of my life used to be my hobby of breeding American Cocker Spaniels. I decided in 2010 that it was just consuming too much of my time and energy and that it was making it really difficult to get away on vacation... so Kellyn and I retired from Cocker breeding at that time. But we sure did have a lot of fun during the 15 years that we devoted to that little hobby! 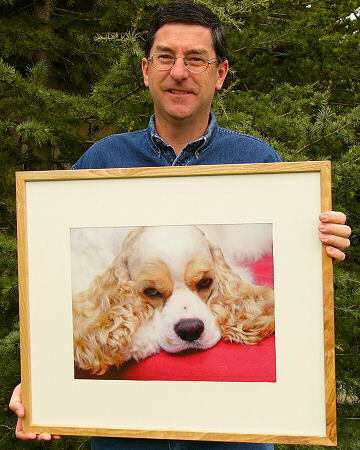 I thought about shutting down the Cocker web site when we retired from breeding Cockers back in 2010... but it's got a lot of good information on it that I want people to be able to find. 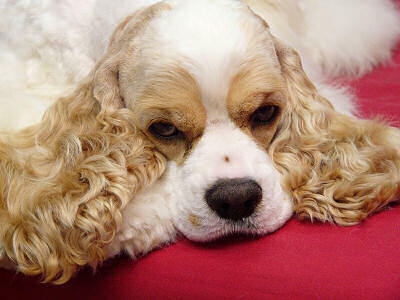 For example, Cocker Spaniels are very prone to getting painful ear infections. Left untreated, they can eventually get so severe that it causes the dog to go completely deaf. One of the most important things on our Cocker web site is a recipe for an extremely effective home made ear cleaning solution. I want to make sure people continue to be able to find that information on my site... it's one of my biggest contributions to the world! For many years, our online Cocker forum was incredibly popular. The forum was a place for Cocker lovers to find each other and converse among themselves. Basically, it was an online community of Cocker lovers. But a few years ago, we started up a Facebook group for our little community of Cocker lovers... and that has now taken the place of the old forum. 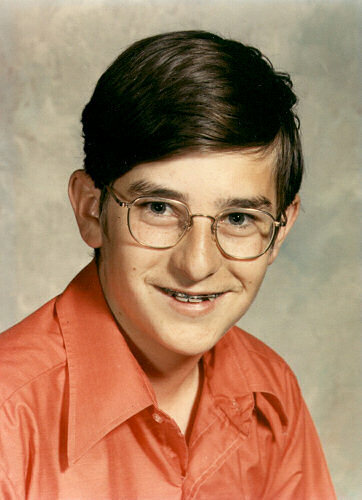 Something that my family likes to tease me about is the fact that I've had the same hair style for at least 40 years! However, there was a short period of my life where I did actually have a completely different hair style. The picture on the right, taken of me in the Spring of 2001, shows you what I looked like while I went through chemotherapy treatments. 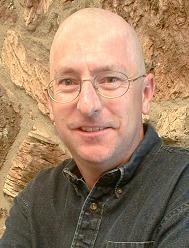 Do you think I looked more like Kojak, Star Trek's Jean Luc Picard, or a neo-nazi skinhead? Why chemotherapy? In November of 2000 my doctor discovered a lump in my neck which turned out to be a cancerous tumor. Lymphoma, to be exact. You can read the full story here, and see some funny photos taken while I was sporting the bald head. Thankfully, after my cancer treatments were completed, my hair came back and I look basically the same as before. And don't worry... the hair came back, but the cancer never did! This particular funny incident happened right in the middle of that period where I was going through chemotherapy and had a completely bald head. It was a scary period of my life... worrying about how serious my cancer was, and enduring all the yucky side effects of chemo. Lots of stress! But one morning I woke up after a really good night of sleep and I literally had (temporarily) forgotten all of my troubles. As I got up out of bed and walked in to the bathroom, I didn't have a care in the world... it was as if my brain had been flushed clean overnight. I had no thoughts of cancer treatments or any of the things (like the loss of my hair) that had happened to me in the previous few months. Until I got in to the bathroom! Out of the corner of my eye I caught a glance of the bathroom mirror and saw some bald guy! It scared the hell out of me! I think I may have actually let out a little yell! I looked in the mirror and literally didn't recognize myself. It was like looking at a stranger, for just a split second before I remembered I was going through chemotherapy and had lost my hair. Sometimes I still laugh about it when I first walk in to the bathroom in the morning!